McFlynn nee Bateson (Moneymore) 7th February 2019, Mary Josephine (Molly) beloved wife of the late Michael and loving mother of Brian, Tom, Amelia, Marion, Michael, Teresa, Blaithine, Siobhan, Garoid, Paddy, Eileen and the late Bernadette, dear sister of Charlie, Tommy and the late Harry, Patsy and Lawrence. Funeral from her home 6 Lawford Street on Saturday 9th February at 10.30am for 11.00am Requiem Mass in Church of St. John and St. Trea Moneymore, interment afterwards in adjoining cemetery. Deeply regretted by her sons, daughters, daughters in law, sons in law, grandchildren, great grandchildren, brothers, nephews, nieces and extended family circle. 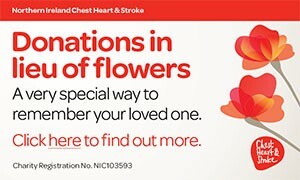 Family flowers only, donations in lieu if so desired to Macmillan Cancer Care or Marie Curie Cancer Care c/o the McFlynn Family. I am sorry to tell you that Mary Josephine (Molly) McFLYNN has passed away.